Congratulations on finding your way to the website for Schrödinger’s Clock™. You may want to see this unique timepiece, so we recommend a visit to Moyses Hall Museum where Schrödinger’s Clock® is part of their collection. You may have reached this web site via Moyses Hall Museum and their web site, or the Schrödinger’s Clock® App, so you will understand that this is a light-hearted challenge on how we think about time and what we mean by ‘NOW’ – as well as the intriguing world of quantum mechanics. This website provides some more background to the App and to Schrödinger’s Clock®. 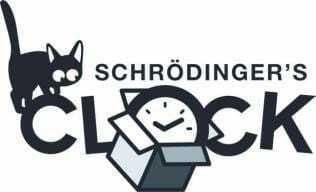 The App illustrates some of the basic principles of Schrödinger’s Clock®; this website provides more detail about the Clock, its purpose, where to see the Clock and how it works, and some introductory references to quantum mechanics, among other topics. The great Danish physicist, Niels Bohr, once said, “If anybody says he can think about quantum physics without getting giddy, that only shows he has not understood the first thing about them.” Schrödinger’s Clock® aims to show you that not all of quantum physics/mechanics will make you giddy! Explore this web site to follow in the footsteps of other great physicists including Erwin Schrödinger, Albert Einstein, Richard Feynman, and enter the puzzling world of quantum mechanics. For any more details about the Clock, follow this link to send an email request.